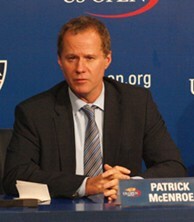 After 10 years as U.S. Davis Cup captain, Patrick McEnroe will resign his position immediately after the Davis Cup World Group Playoffs against Colombia, Sept. 17-19. McEnroe announced his intentions during a press conference at the 2010 US Open and also announced that Sam Querrey, John Isner, Mardy Fish and Ryan Harrison will be on the team that will travel to Colombia to try to keep the U.S. team’s spot in the World Group for next year. McEnroe has been the general manager of USTA Player Development since 2008, a role that is an important reason for his decision to step aside, as well as to spend more time with his family that includes three young daughters. "(I am) officially resigning after we finish this relegation match to focus more on what José (Higueras, director of coaching for Player Development) and I have been working on for the last couple of years in Player Development, and obviously to focus, as well, at home on the family," McEnroe said. "But the Player Development certainly is a huge reason for why I'm deciding that now is the right time to step aside. We have a great core group of young players coming up," he added. "For me, obviously, it is mixed emotions for me because of what Davis Cup has meant to me for 10 years, to the players who have supported it. But I feel now is a good time for a transition, and I can focus on my professional energies, Player Development, and obviously will still be very involved with the team and who plays on the team and supporting the guys that are part of the team." McEnroe is the longest tenured Davis Cup Captain in U.S. history, having taken the reigns in 2001, and he has compiled a 16-9 record, including leading the team to the 2007 Davis Cup title. It was the first Davis Cup title for the U.S. since 1995, and his 16 wins are second all-time in U.S. Davis Cup history. He has sincerely enjoyed being the U.S. captain and is proud of what the team has accomplished in his tenure. He will miss being part of the team and all the guys who have been part of it through the years but, of course, he will still be around them and feels this is the right time to focus on Player Development. "From when the USTA first hired me with the team that was in place until now, it's been just an amazing journey. There has been incredible support for me and for the team, and I have been very appreciative of it. I'll miss the team, the guys, but obviously I'll still be around them with this job," McEnroe said. "There's nothing like working out there with a group of guys that you love and respect. And having the National Anthem played, there's nothing like that. There never will be anything like that for me again, professionally. "They take a lot of pride in what we're doing with our program, and this job is really more day to day, and on it all the time," he added of Player Development. "I just felt that it was the right time for me to step aside. We've got a great new group of guys, and I hope that the next person can have the same experiences that I had."